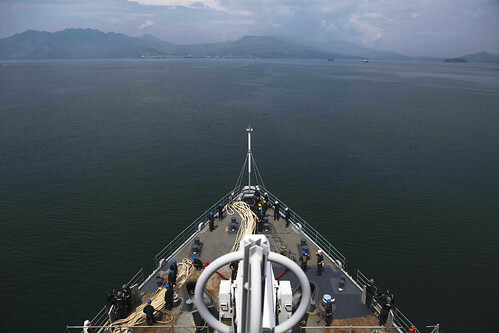 SUBIC BAY, Philippines - The amphibious dock landing ship USS Ashland (LSD 48) became the first U.S. Navy ship in the 7th Fleet to conduct amphibious operations with the newly established Japan Ground Self-Defense Force (JGSDF) Amphibious Rapid Deployment Brigade (ARDB) troops and their equipment, Oct. 2. 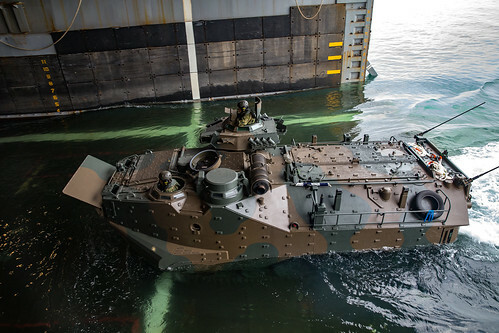 JGSDF assault amphibious vehicles were recovered by Ashland Sailors and embarked Marines from 31st Marine Expeditionary Unit (MEU) during humanitarian assistance and disaster response (HADR) training as a part of exercise Kaagapay Ng Mga Mandirigma Ng Dagat (KAMANDAG) 2. The ARDB, formed on March 27, 2018, brings new capability to the Japanese Self Defense Force (JSDF) by combining ground forces, aviation support and logistical capabilities into a cohesive unit capable of operating from the sea and reacting to a variety of scenarios, including self-defense and humanitarian assistance-disaster relief. KAMANDAG 2 is a bilateral, U.S., Philippine, military training exercise with U.S. forces being led by the 3rd Marine Expeditionary Brigade. This year, Japan Self-Defense Forces are participating in HADR portions of the exercise to expand the capabilities of their newly formed ARDB. Ashland will be working with allied nations and their marine forces conducting various amphibious operations focused on humanitarian and disaster relief (HADR) during the exercise. In addition to HADR, exercises conducted during KAMANDAG 2 will consist of amphibious operations, counterterrorism, live-fire training, as well as jungle survival and combat lifesaving training. KAMANDAG, an acronym for the Filipino phrase “Kaagapay Ng Mga Mandirigma Ng Dagat,” which translates to “Cooperation of Warriors of the Sea,” refers to the partnership between the Philippine and United States militaries. Ashland, part of the Wasp Amphibious Ready Group, with embarked 31st Marine Expeditionary Unit, is operating in the Indo-Pacific region to enhance interoperability with partners and serve as a ready-response force for contingency operations.